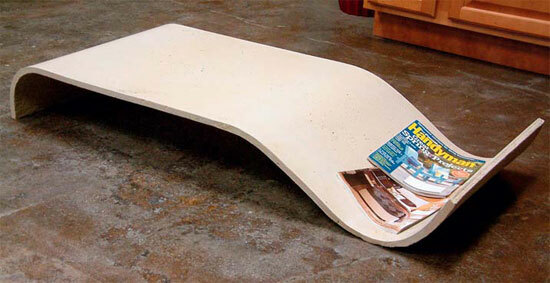 A magazine-holding table made with Xtreme Countertop mix. SureCrete, a manufacturer of decorative and specialty concrete, partnered with CarpenterStone, a material science company, to introduce this new line of advanced cement-based products at World of Concrete 2008. The first entries — a cementitious countertop material, a lightweight cement composite and a cementitious stampable overlay designed for use over asphalt or concrete — are already on the market. Several other Xtreme Series products are slated for release by about the time of World of Concrete 2009. A lightweight wall spray is scheduled for early summer, a self-leveling mix is due by first quarter 2009, and a terrazzo flooring mix, which will whittle 10-to-12-day curing times down to three or four days, will have a soft launch this fall. All of these products will promise unparalleled strength, impressive weight ratios and accelerated installation times. So what is CarpenterStone? It’s an admixture that improves the bonding of cement to lightweight aggregates and reinforcing fibers. “Its claim to fame is that it increases your ability to add more fiber and evenly disperse it in the mix than was ever thought possible,” says Damon Hoover, sales manager for the CarpenterStone division of SureCrete Design. According to CarpenterStone press materials, CarpenterStone mortar is about 65 percent lighter than concrete. Its ingredients bond using less water and with chemically controlled evaporation, resulting in a mortar that is lighter and stronger. In fact, the name CarpenterStone comes from the fact that a concrete piece augmented by the admixture can be nailed, cut, stapled and screwed like wood. Concrete pieces created with Xtreme Lightweight can be cut with a handsaw. A particular strength of the Xtreme Lightweight composite is that it is mold-resistant and fireproof, making it a good choice for either encapsulating or replacing foam on buildings. The addition of CarpenterStone can take a vermiculite concrete mix from under 300 psi up to 2,200 psi, thanks to the additional fiber reinforcement, Hoover says. CarpenterStone improves curing time in any mix it supplements, he adds. A slab that might require one or two months to fully cure can have that time reduced to one or two days. The Xtreme Series with CarpenterStone is manufactured by SureCrete, which also manages sales and training for the line. For its part, CarpenterStone retains the patent on the admixture and still sells it directly to large, high-volume institutions. A SureCrete Xtreme kit contains materials in a premixed state, to be assembled by a supplier or contractor.